(MoneyWatch) COMMENTARY They say opposites attract, but I'm pretty sure the opposite is also true, as in birds of a feather flock together. It's a paradox that I think applies in business and in life. For example, while it may make sense for management teams to have a diverse range of complementary skills and experiences, successful companies also benefit from having a common corporate culture and belief system. My wife of 22 years and I are completely different. Obviously we were attracted to each other, but about the only thing we've agreed on since is that we don't get along, not even a little. There's that paradox again. I've long observed that some of the most important business and life lessons are counterintuitive or paradoxical. Indeed, Lao Tzu's Tao Te Ching suggests that "all behaviors contain their opposites" and you should "learn to see things backwards, inside out, and upside down." Here are 13 counterintuitive business truths I've come to know, even if I can't exactly explain why they make sense. The first truth actually relates to that very subject: the how and why of things. To understand how things work, just observe; don't ask why. This is more or less the Tao Te Ching in a nutshell. It's pretty much all based on experience or observation. Obviously, there are times when understanding why is important, but most of the time it just complicates things and keeps you from seeing the simple truth of what's really happening. Perception is reality. You may build and market a product, but what you think of it doesn't really count. The only thing that really matters is what customers think of it. Likewise, the real you is how others perceive you, not how you perceive yourself. You have to take risks to increase stability and security. If everyone's going one way, go the opposite way. AKA the "fools rush in" effect. It's usually better to do the opposite of what everyone else is doing or telling you to do. I actually understand the "why" of this one: Markets are more or less zero-sum games. Even if there's some market growth, there's still a finite number of winners. Bubbles are an exception, but they're not sustainable, and everyone loses when they collapse. The more you seek to control things, the less you control. Try too hard and you lose everything; let go and you gain everything. When you have problems with others, the answers are within you, not them. If you seek consistent success, then you have to change with the times. If you maintain the status quo, as Machiavelli understood, over time you will lose. The best salespeople and negotiators say the least. You can't learn anything by listening to yourself speak. If you want to grow big, think small. Capturing niches is the best way to grow a business. Anyone who seeks to build an empire or get rich will inevitably fail. Obstacles and opportunities are one and the same. Also a Machiavellian observation. Inspiration and big ideas can come from doing as little as possible or from mindless, repetitive tasks. In a competitive market your goal must be to maximize sales, not profits. All things being equal, if your goal is to maximize profits, then you'll lose business and your sales will eventually spiral down. But if your goal is to increase sales, then you'll gain business and economies of scale and your profits will ultimately increase. People who act like they know it all know the least. Now I want to hear from you. 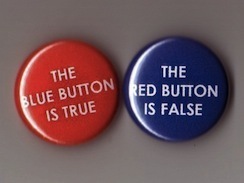 What's your favorite counterintuitive or paradoxical business truth?